Italian officials announced removal operation of more than 2,300 tons of fuel from the grounded Costa Concordia cruise ship has started. The operation began on Sunday afternoon, nearly a month after the ship hit a reef and capsized off the island of Giglio. The process had been delayed by both the search and rescue operation and bad weather, prompting fears of a leak into the protected waters off the island. Seventeen people died when the ship capsized and 15 more are presumed dead. Captain Francesco Schettino has been accused in Italy of manslaughter, causing a shipwreck and abandoning ship before all those aboard were evacuated. Prosecutors in France have also launched an investigation, given that four French nationals died and two others are among the missing. Dutch salvage company Smit is conducting the operation to pump out the fuel, which is expected to take about four weeks to complete. It will concentrate on the first of 15 tanks that are believed to hold around 84% of the fuel on board, the AP news agency quoted Italy’s civil protection department as saying. Valves will be fixed to the tanks, allowing oil to be pumped through a hose on to a crane barge alongside the vessel. From there the oil will be transferred to a waiting oil tanker. As oil is removed, water will be forced in via a second hose to fill the vacuum. 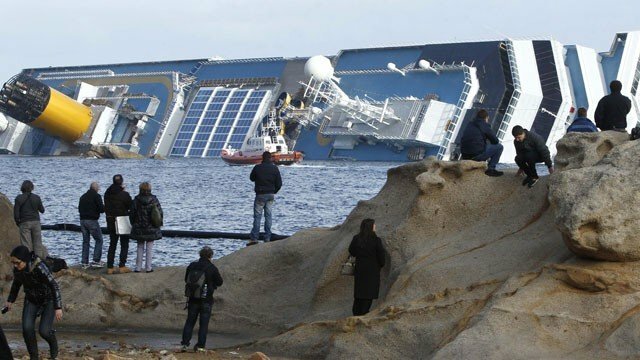 whars the latest info on the rempval off the costa concordia? Osama Bin Laden's instructions to his children: "Go to West and get a good education"